Download this TEACHER’S Guide because Speech just may be the most useful course your teen takes in high school. That’s what lots of our former Speech students in our local homeschool community tell us after they have graduated and moved on to college and the work force. We’re so happy to introduce our level I Speech Curriculum for High School! Why study Speech with 7Sisters? Vicki Tillman and Sabrina Justison have well over a decade of experience teaching Speech and Acting, including Vicki’s successful foundation of the Tri-State Homeschool Network Rhetoric League and Sabrina’s wildly popular Drama Camps. Both have served as judges for many years at the ACSI Regional Speech Meets that provide competition experience for teens from high schools in our area. Many people rank Public Speaking as one of their greatest fears. Our Speech curriculum for high school is designed to remove the intimidation factor and provide so much FUN along the way that Speech becomes an opportunity for success instead of a recipe for disaster. Shy kids learn to find their voices and confident kids learn to hone their public speaking skills. College admissions officers are looking for Speech on the high school transcript. Employers are looking for confident, articulate job applicants to hire. You can help your teen acquire Public Speaking skills and make happy memories along the way. Only the teacher or group facilitator needs to purchase this .pdf TEACHER’S Guide; it includes the full curriculum and should be accompanied by the Speech I Student Workbook. Each student in your group needs to purchase a copy of the Speech I Student Workbook — click here for the $4.99 workbook! Speech I (Teacher’s Guide) includes 15 Lessons with Alternate Practice ideas included with each to make it easy to expand the curriculum for a FULL YEAR of weekly Speech classes. A second addendum .pdf file is also yours at purchase; it contains the Evaluation Sheets for each lesson formatted on individual pages to make it easier to print and distribute to your students and parent evaluators. Speech is a part of a high school English/Language Arts credit. 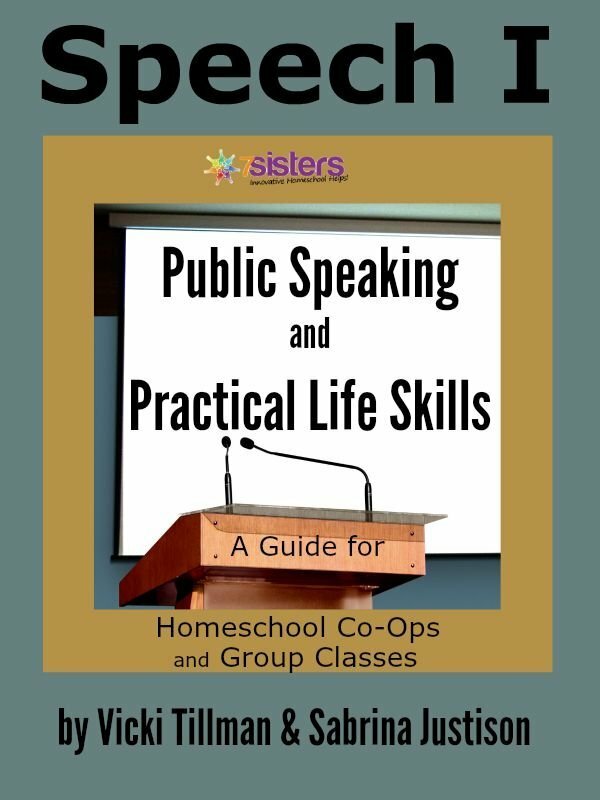 Along with Literature, Writing, Vocabulary and Grammar, Public Speaking creates a powerful entry on the homeschool transcript. Log the hours your student spends attending Speech class meetings and preparing presentations; 120-135 hours equals one credit using the Carnegie Unit model (for more on earning credits by logging hours, read this post, “5 Cool Ways to Earn Homeschool High School Credits” on the 7SistersHomeschool.com website). If you need more information on the components of the English/Language Arts high school credit, watch this short video we created to help you – “What to Include in a Homeschool High School English Credit”. “The course is organized very logically, and with good skill progression throughout the term. What I like most about it for my daughter is that it is written in such a way that you can just about see the author smiling. The joy that comes forth while we are working together through the assignments and preparations is amazing.” Here’s a link to the rest of her post at OneMom.com.